Le Réve is undoubtedly the most luxurious, exclusive and freehold residential tower built in the world famous man made Dubai Marina. 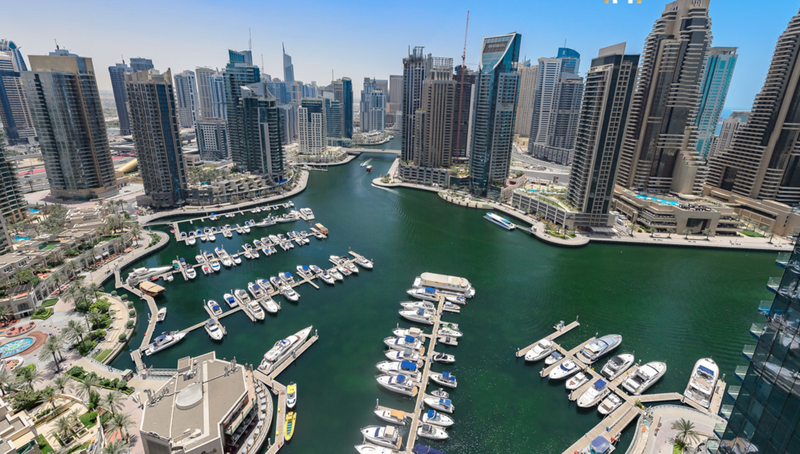 Located opposite to the Jumeirah Lake Towers and next to the Dubai Internet City. Designed by the award winning Architect and Project firm Atkins and interiors by KCA. Le Réve has become a regional benchmark for this market and has collected a number of international awards since then. This ultra-luxe building includes amenities such as a special security team and systems, a private valet parking reception, a temperature-controlled rooftop pool, landscaped gardens designed by Andrew Pfeiffer, a cutting-edge technology fitness center designed by tennis superstar Roger Federer. A 24-hour all around services that range from a special security team, doorman, concierge and butler, to a chauffeur-driven limousine service, as well as having the ability to book a Ferrari, a helicopter or a business jet with the press of a button. This presidential penthouse is surrounded by unhindered views of the ocean, the Dubai Marina, Burj al Arab and Palm Jumeirah. 6,100 sq ft of Luxurious living at its best in the last new and inhabited unit available in the building. The penthouse features 4 bedrooms all with en suite bathrooms with an additional powder room located in the expansive foyer area. Fully fitted Milan kitchen with the most captivating finishes. No expense was spared in the design and construction materials of this penthouse. From the floors, woods and vanities to the fully automated smart home system that includes lighting, temperature and multimedia controls from every suite, as well as an incredible private terrace of 870 sq ft with the most captivating views to the Dubai Marina and the ocean.